I,m guessing now, Silver Drift or Silvadoris? Opps sorry I forgot to trim it ! Need some help with this one? owned by a very distinguished couple Dont think he is with us anymore but I wouldnt swear to it! That's an old friend of mine, GG Maximo..
well done ***** perhaps you can tell us if he is still around? Last I heard he was, he'll be 27 now. I haven't seen anyone from Briery for a while, I will ask next time I do. He was a lovely boy, super temperament.. 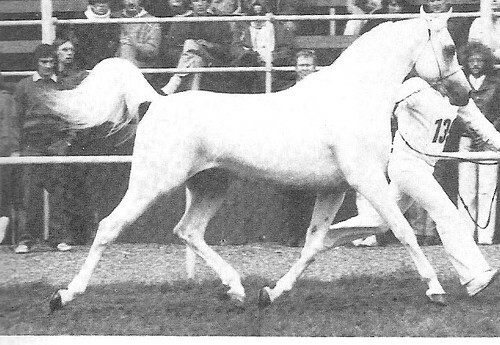 I am sure this one has been in earlier quizes, but can you tell me who this foal grew up to be? Is the first one AN Malik, Maximo's Dad?.. I found this one in one of my old magazines, anyone know who he is? 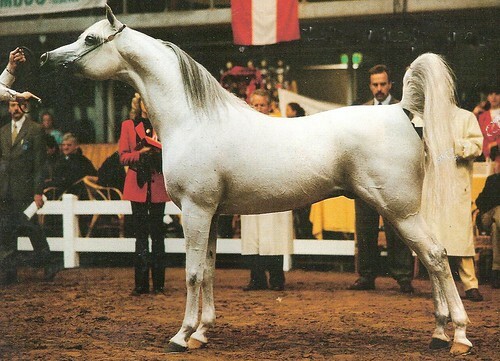 It could only be, WSA Charismma***, sire of three of my babies!!!! Am I right? You must have been lurking Nicky yes of course you are right***** perhaps this will get you started on the quiz now? still one to answer? need clues? I love that picture of him Lynda ! Is Zircon Nazeer still with us? He must be well into his 20's by now and was snowy white in the last picture I saw of him. Hanif to the black and white piccie? Can't be Camargue, picture too old?